During the summer of 2013 the Conservancy was informed by Rich Talbot, the director of the Office of Public Archaeology at Brigham Young University in Cedar City, Utah, that the Smith family was interested in preserving 196 acres of land that contains a significant rock art site. Reva, Blake, Marlin, Scott, and their families represent the third and fourth generations of Smiths to use the property, and they decided to donate it to the Conservancy in honor of Adelbert Smith, who purchased the land in the 1950s. In the fall of 2012, the Conservancy made arrangements with the Smith family to see the site. Blake Smith led Lane Richards from Brigham Young, rock art expert Charmaine Thompson of the U. S. Forest Service, and members of the Conservancy to one of Blake’s favorite petroglyphs, a human figure that appears to be donning an elaborate headdress. 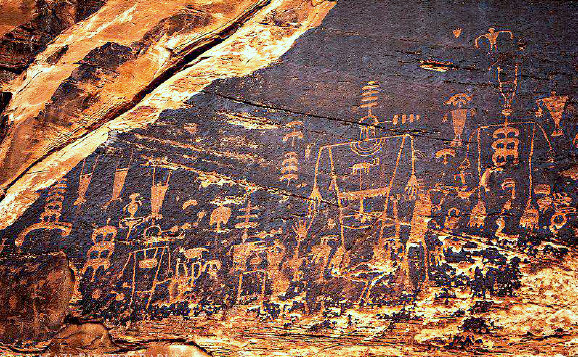 Other petroglyph styles included geometric shapes and animal forms, as well as abstract designs. The preserve installed their information kiosks in March 2019, and is preparing for an opening in Fall 2019.